Palm Springs is a great destination if you’re just planning on relaxing in the sun and having fun. At just around 3 hours from San Diego as well as Los Angeles, it is one of the perfect tourist destinations. There is plenty to do when it comes to Palm Springs. If you come to Los Angeles you have to make this drive to the desert. If you want warm weather, cabanas and cocktails by the pool this is the perfect destination. Casinos: If you like to gamble and can’t make it to Las Vegas, Palm Springs is a great alternative. You can play slot machines and some alternative table games. They have a great bar and Steak House at the Spa Casino in Palm Springs. There are few others in the Palm Springs area. Palm Canyon Drive: This is one of the main areas of attraction in Palm Springs. You will find many great restaurants and bars to fit your taste buds. You can also shop or browse all the jewelry and clothing stores. There are some great bars and night life. 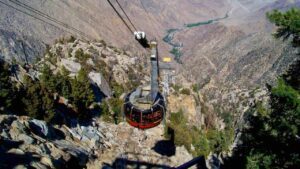 This tramway is next to mount San Jacinto which has a height of 10,000 feet at the top. The tramway provides you with some of the most scenic views of the entire area. It would take you up to a height of 8500 feet. If you are a history and aviation buff, this air Museum is the perfect option for you to visit. It consists of plenty of Second World War aircraft’s which are in completely functional condition. The entire collection of aircraft is displayed in the hangers. Palm Springs has many extensive golf courses. Some of them being, Indian canyons golf resort, Desert Willow golf resort, Marriot’s shadow ridge and the classic club. These botanical Gardens are actually unique as they only display the desert-based plants and trees. Thus, you would be able to come across many cacti as well as other desert plants. Village Fest is organized on Thursday evenings. It is organized in downtown Palm Springs. The Fest consists of more than 180 vendors who sell mostly handmade and vintage stuff like arts, trinkets, and jewelry. The Fest also consists of many performers. 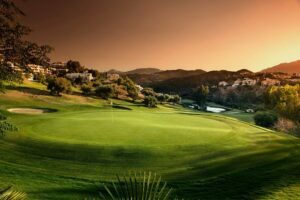 It starts at around 7 PM and lasts up to 10 PM on Thursday evenings.Thus, when you’re heading over to Palm Springs, there is much more to it than just golf courses. These are some of the tourist attractions which you should definitely frequent in Palm Springs.